The expectations in Cheney are lofty. Big Sky Conference preseason favorite Eastern Washington opens camp Sunday with 17 returning starters – nine on offense, eight on defense – including one of the top quarterbacks in the country in two-time Walter Payton Award finalist Gage Gubrud. Following a 7-4 campaign and an FCS playoff snub, a few questions follow second-year coach Aaron Best’s squad as it heads into camp. Who will emerge as the Eagles’ next big-play receiver? Gubrud rarely threw the home-run ball last season, a product of losing a pair of current NFL receivers in Cooper Kupp and Kendrick Bourne and one of the conference’s most dangerous speedsters, All-American Shaq Hill. Nic Sblendorio, who made a living on short and intermediate routes, was the go-to target in 2017 but has exhausted his eligibility. A stable of proven pass-catchers returns, however, including Nsimba Webster (59 catches, 693 yards and five touchdowns). Terence Grady appeared in just six games last year but exhibited big-play ability when healthy. EWU’s third-leading receiver in 2017, Zach Eagle (24 catches, 286 yards), also returns, along with Dre’Sonte Dorton and Jayson Williams, who’ve both registered starts. Tight end Talolo Limu-Jones has also been converted to receiver . Sophomore Johnny Edwards IV and redshirt freshmen Andrew Boston and Marques Hampton Jr. are also looking to carve out substantial roles. There’s enough talent end experience to go around, but who will establish themselves as the EWU next great pass-catcher? Will more turnovers be forced? EWU ranked 105th in the country last year in forced turnovers and was near the bottom of the Big Sky Conference. With an offense as potent as EWU’s – it led the Big Sky in total offense (5,244 yards) and was fifth in the country – takeovers can change the game, and the Eagles’ defense only recorded a baker’s dozen. EWU also gave up 23 turnovers. 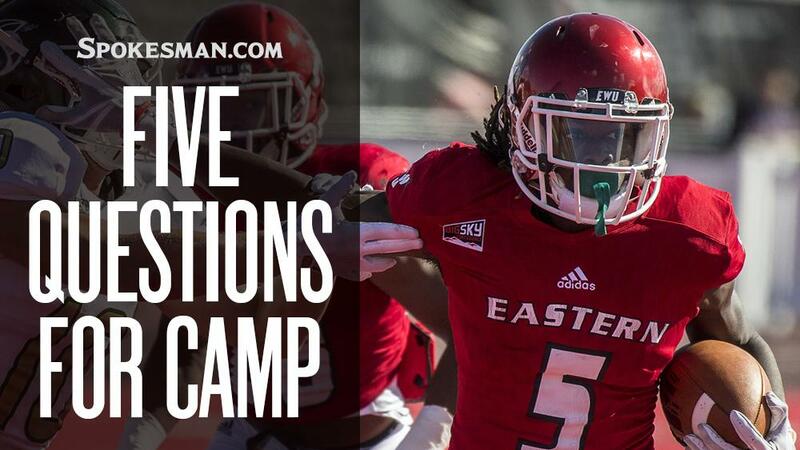 With the return of a loaded secondary – defensive backs Mitch Fettig, Josh Lewis and Nzuzi Webster have all earned conference honors – EWU will look to grab a few more footballs out of the air. They’ll need help up front, though, from a defensive line that had trouble applying consistent pressure. The graduation of defensive end Albert Havili, now a member of the San Diego Chargers, doesn’t help that cause. The return of 2016 All-American defensive tackle Jay-Tee Tiuli, who sat out last year with an injury, is a boost. Can this be Antoine Custer’s breakout season? By ground and by air, shifty junior Antoine Custer Jr. – also a dangerous return man – has continued his ascent among the Big Sky’s best running backs. With 2,154 career all-purpose yards, Custer, a Big Sky second-team selection a year ago, appears primed to take the next step in his career. Best is pushing for an improved run game. With Custer getting the bulk of the carries (157 carries, 820 yards and 10 touchdowns in 2017), he could register his first 1,000-yard season and put himself in elite company. Will an experienced offensive line become better run blockers? The offensive line will work around co-captain Spencer Blackburn, its trusty center, for the third year. Even with the offseason retirement of left tackle Brett Thompson, the group boasts plenty of experience with starting guards Tristen Taylor and Jack Hunter, along with right tackle Chris Schlichting. Pieces will be moved to replace Thompson, who helped the Eagles average 156.3 yards on the ground last year, a number Best wants to improve by at least 20 yards. The line has often given Gubrud ample time to throw, but can it improve its run-blocking for Custer, Sam McPherson and the mobile Gubrud? How will the Eagles react after missing the playoffs? EWU believed it had the résumé to be in the 24-team FCS playoff field last year. An outright Big Sky Conference title would do the trick. The Eagles’ conference schedule includes five teams ranked in various FCS Top 25 preseason polls, not including a game at Northern Arizona, another ranked Big Sky squad. The game won’t count in the conference standings, but could have postseason implications. EWU is the prohibitive Big Sky favorite, ranked first in the coaches’ and media polls and ranked as high as No. 4 in HERO Sports preseason Top 25 polls. A season of redemption. High expectations. A brawny slate. The Eagles will know a lot more about themselves after a five-game September, which includes a Sept. 15 trip to Washington State. Published: Aug. 3, 2018, 6:10 p.m. Updated: Aug. 3, 2018, 6:45 p.m.